Adirondack Chair : Why to choose us. We offer you the best quality of available Adirondack Chair on the market, with solid guarantees: A guarantee of 10 years covers all our products. Besides, our guarantee 100 % satisfied assures you the entire refund in the 10 days according to your purchase if you are not fully satisfied. Why to choose Chaise-Adirondack.com ? We are in online business since 1999 with our web site 100 % hammocks. After travelling in Brazil in the eighties, we decided to import hammocks to make them known to the French customers. We started to sell them to market places and fairs. We started our online shop www.hamac.fr In 1999 by selling our own collection of high quality hammocks imported from different countries like: Brazil, Columbia, Mexico, Salvador. Our philosophy is your satisfaction: Share the best. While we travelled around the Globe, we discovered a beautiful country: Canada. Friendly and cheerful people. Despite of short summers, main back yards and gardens are fitted with their famous Adirondack chairs also called Muskoka chairs. We really appreciated the comfort , the design and the flagrance of the Cedar. Back to France we looked to find something similar but nothing great… So we decided to import to Europe the best quality of Adirondack chairs. During last years, we have seen and tested many chairs in eastern countries bu it was very cheap in price and quality. After searching, I found the best quality in Canada !. In the same way we did for our hammocks, we decided to offer a high quality of genuine Adirondack chairs, durable for last generations made in Western Red Cedar certified FSC from Canadian forests. 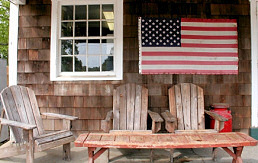 Since 1955, this woodworks fabricates the best Adirondack chairs from North American market. We are proud today to offer you the highest quality of Adirondack chairs made in Canada. 1. In business since 1955 we stand behind everything we make. We do more than just make cedar garden furniture. we build hand crafted heirlooms that last generations. 2. We offer a 10 day FULL refund return policy (and we pay the return freight with no restocking fees). you can buy safely online and decide once you receive the product if it is everything you wanted without it costing you one dime if it isn't all you dreamed it would be. 3. We offer a 10-year written guarantee on every product we make. That means if a piece breaks or splits we will replace the broken piece free of charge. You can rest assured your product will last and our longevity ensures you we will be around for many years to come to continue to provide quality service and products for your future needs. 4. We are an American and Canadian Company and proud of it. Our staff come from both sides of the border and adds their distinctive heritage to our company. We are excited to be manufacturing the finest in US & Canadian outdoor cedar furniture. 5. We take care of our customers offering them exclusive specials in the future in addition to referral programs where our customers can earn money or credit for each referral that results in a sale. When you buy from The Best Adirondack Chair you become part of our valued family of customers. We take care of our family and that includes YOU. 6. We continue to improve and add new products to our line so that we can provide for your future needs. If you have a suggestion, we listen. if you want something custom made, we can build it (during off season). if you have an idea for something new that we haven't considered, we will give you the first prototype if we add that new product to our product line. In other words, we value your ideas, opinions, and suggestions. 7. We maintain the traditional beauty of the products we make while adding minor changes to improve comfort, strength, endurance, and aesthetic beauty. After all when you are home relaxing in your garden we want to make sure you have furniture that will fit your lifestyle with the ultimate in comfort. 8. We use western red cedar for our products which is naturally rot and insect resistant. A definite plus for places where termites or wet weather can destroy other types of wood.